Ramadan is the holiest and most awaited month in Islamic calender. It is also considered as one of the most significant pillars of Islam. Muslims across the globe celebrate this with much devotion and sincerity. During this holy month, Muslims fast and reflect spiritually. From dawn to dust, those who have physical capability are required to observe fasting. But Ramadan is not just about fasting. It’s also a time for spiritual reflection and devoting themselves to worshipping and praying to GOD. Fasting in Ramadan is not only abstaining from food but also from evil actions, thoughts and words. Being living in Dubai for the last 13 years we also look forward to this holy month with the same zeal and fervor as muslims do. Ramadan is the time when our fast paced life hits a pause button and we get a chance to reconnect, cleanse and change ourselves. This is the time of giving. All the Restaurants, Cafes and Eateries are buzzing with people at the Iftar time(The meal eaten after breaking the day long fast). Your taste buds just go on a gastronomical ride while looking at all the goodies, pakoras, samosas, shawarma and all the Indian and Arabic sweets. Staying in Dubai and not getting to love this dessert “KUNAFA” is just so impossible. You will find this dessert almost everywhere, and it is so hard to resist to try it. And once you try there is no looking back. You would love to know that it is pretty easy to make. 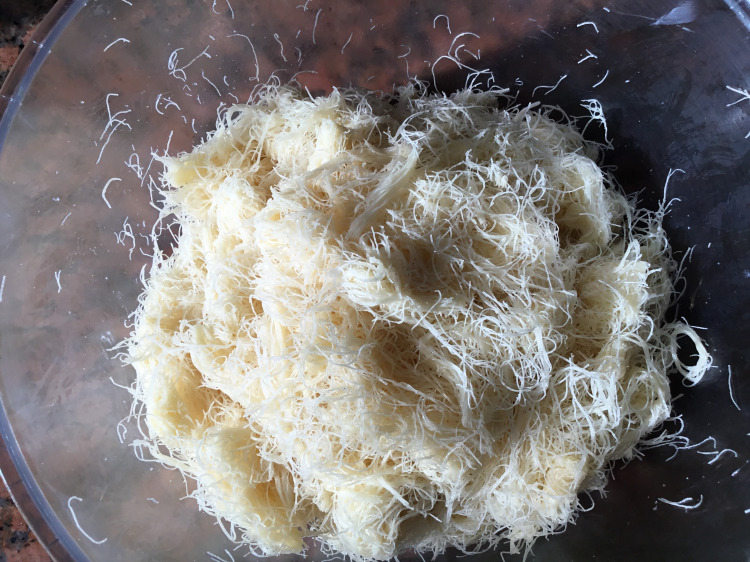 The kataifi dough is easily available in the supermarkets. 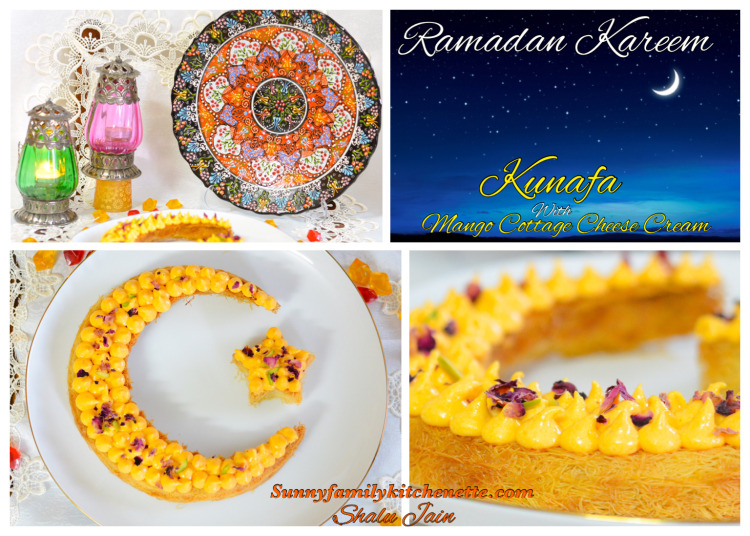 I wanted to make something extra special to show the spirit of Ramadan. Something which just gives you a pious feeling and takes you to another serene world. 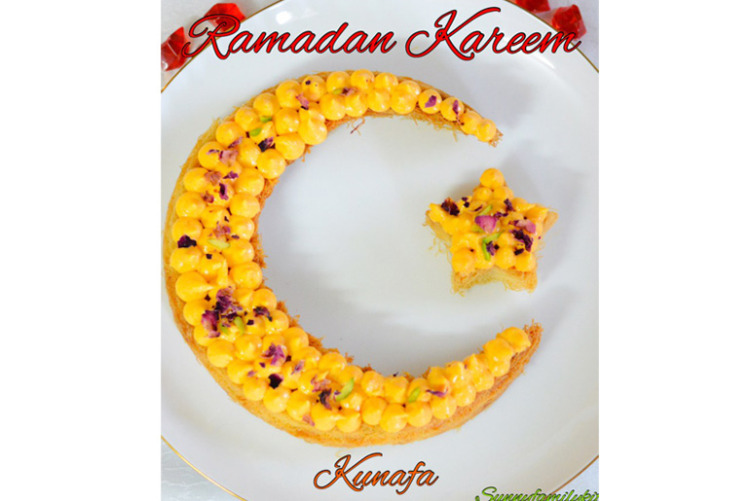 And so I thought of making KUNAFA– a quintessential Arabic Dessert. 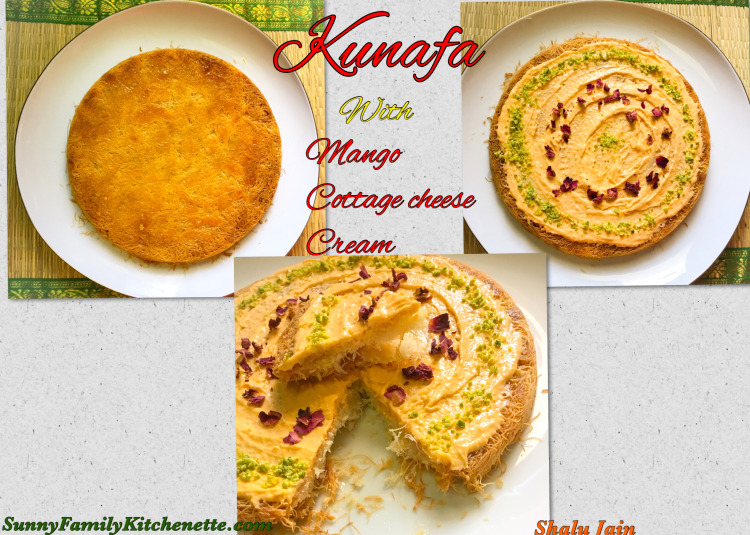 Kunafa is made by baking Kataifi dough which is easily available in any supermarket. Generally the center layer is of cheese. My twist here is that instead of giving it a cheesy centre I made a cream of Low fat home made cottage cheese ‘paneer’ and Mango. And to my surprise this creamy icing was super yummmm and flavorful. So, lets start making this superb dessert by looking at the ingredients. Start by making Syrup and Cream simultaneously. 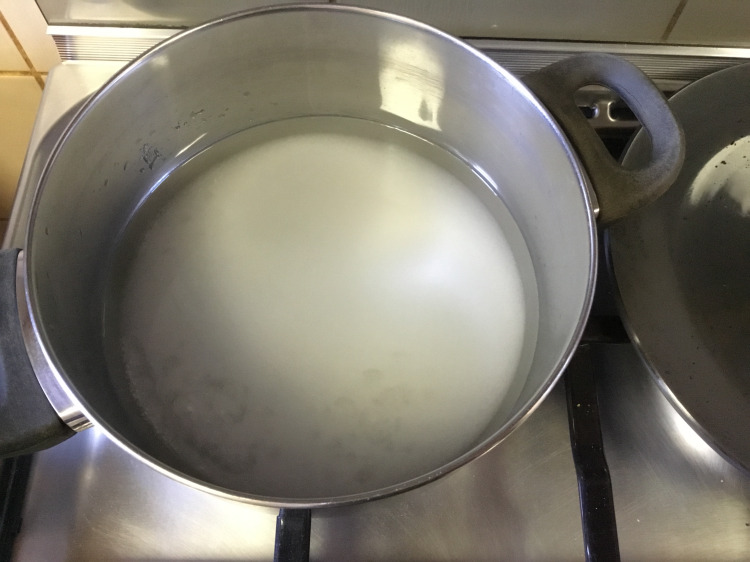 Make sugar syrup by boiling water and sugar. When the sugar has dissolved, boil for 3 to 4 minutes and switch off the flame and add lemon juice. 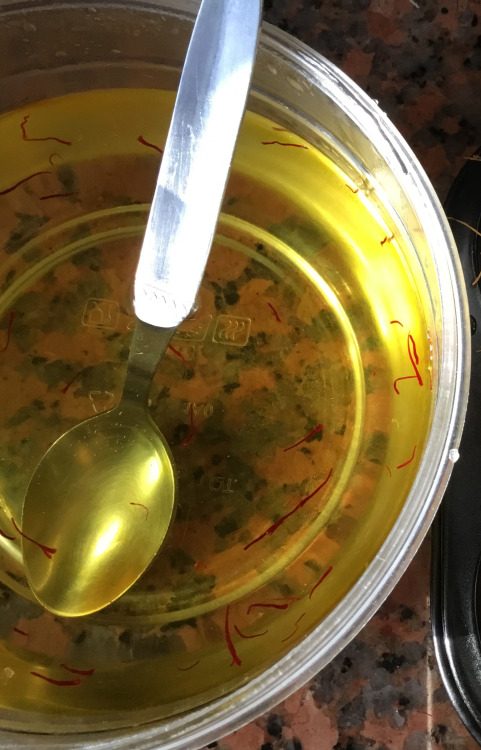 Add in Saffron strands and rose water too.Set aside this sugar syrup. 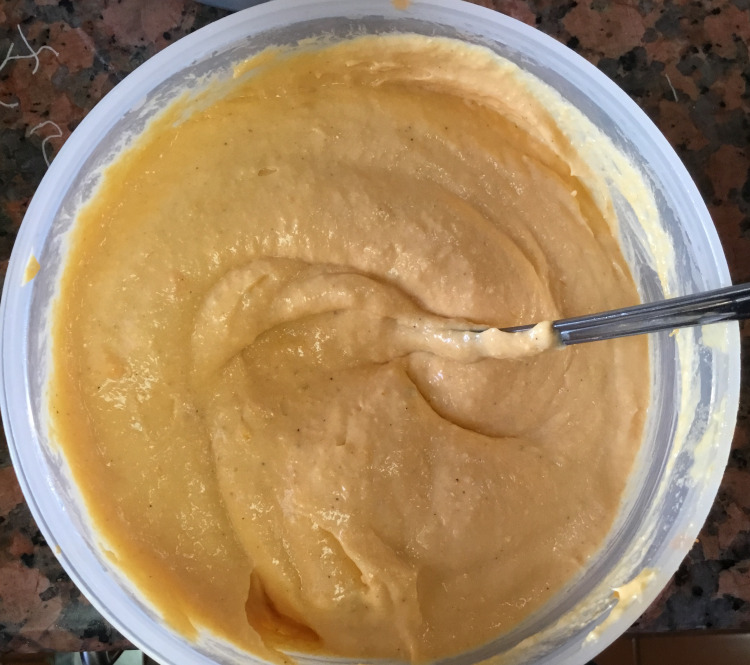 With the help of hand blender blend together all the ingredients for the Mango Cream. Keep this Icing in the Fridge. I’ve used home made low fat paneer to make this. Now sugar syrup and mango cream are ready. Preheat the oven at 180*c for 15 minutes. In the meanwhile lets prepare the dough. 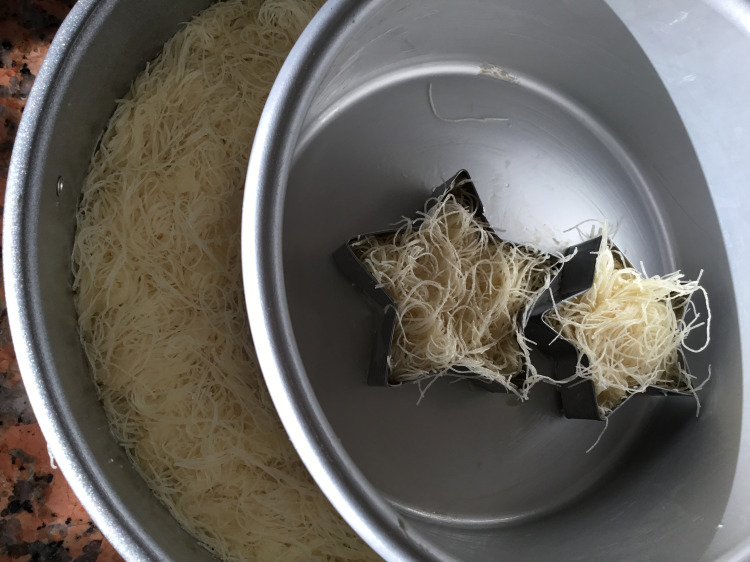 In a large bowl, loosen the kataifi dough. 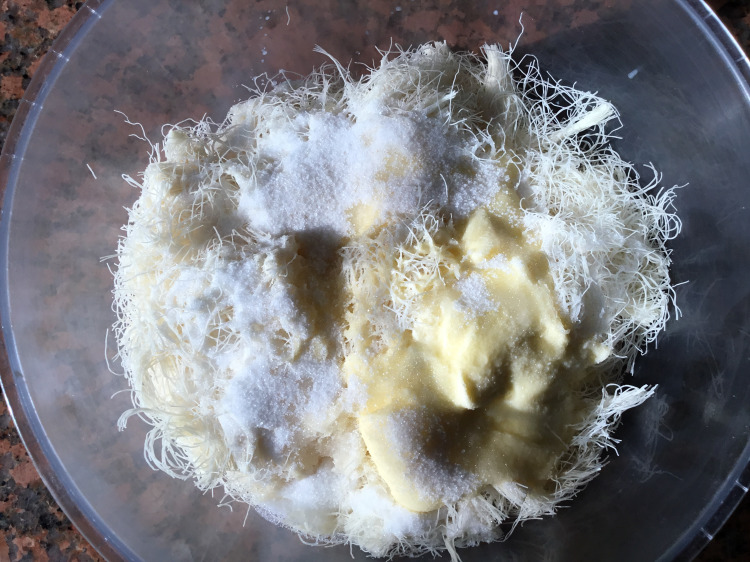 Melt the butter and add this to the kataifi dough slowly while breaking and separating the strands. 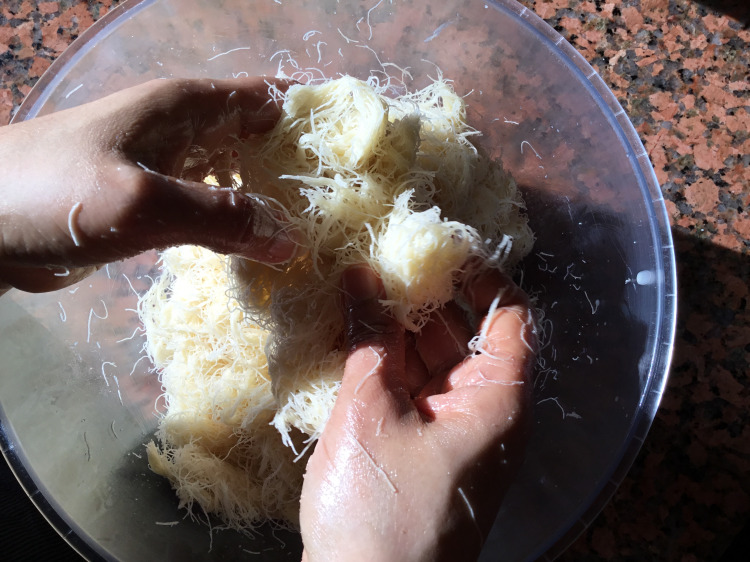 Add in the Sugar and rose water to the kataifi and mix thoroughly. Grease the dish in which you want to bake the Kunafa. 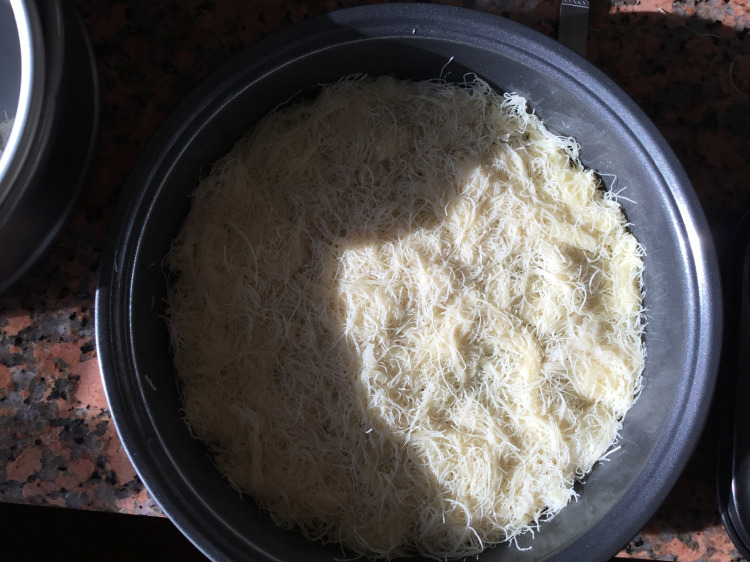 Spread a layer of the prepared kunafa dough. Press it a little bit and spread some more dough. I wanted a Crescent Moon shape so I took dough and arranged it in a springform tin like this. Apart from this I used two more pans. 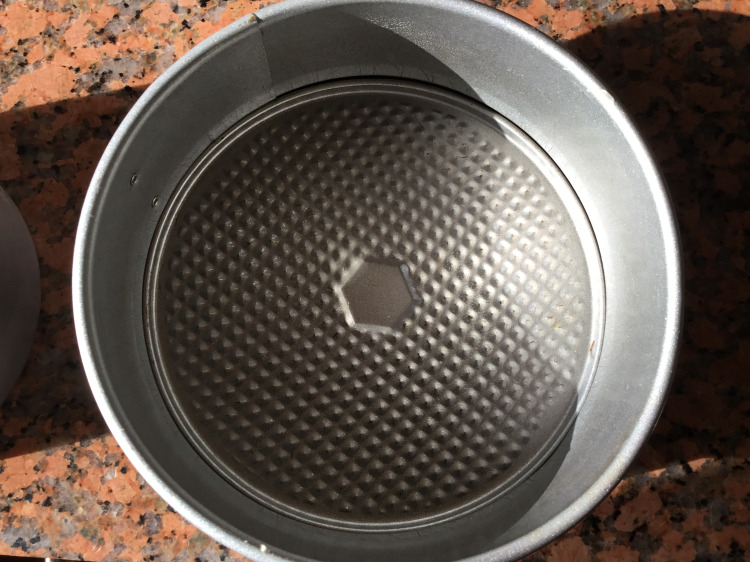 9″ round pans of 2″ height. When your pans are ready and the oven is preheated put the trays in the oven. Immediately pour cold sugar syrup evenly over the hot kunafa. Let cool completely to room temperature. Invert onto serving plate. 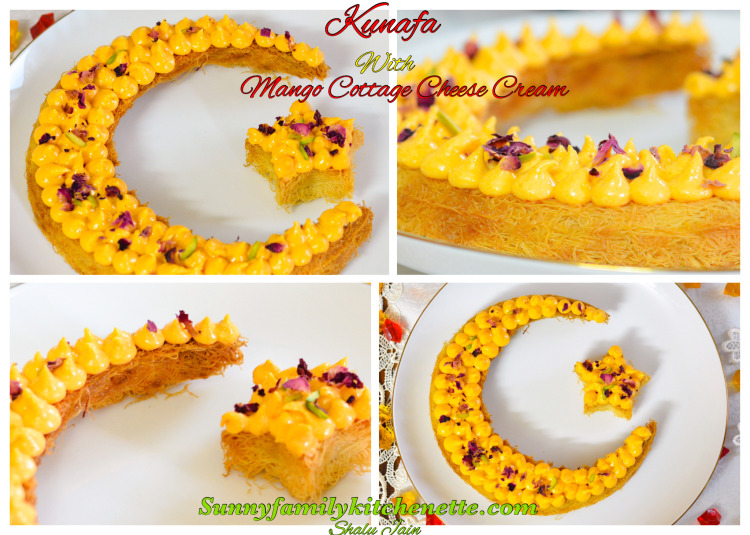 When it is completely cooled put some Mango Cream on the Kunafa. Garnish with Crushed Pistas and Rose petals.